Born in 1993 in the village Yabluniv, Ternopil Region, Ukraine. He studied at the Kabalevsky Music School in Orel (Class of Galina Khostko). He graduated at the Prokofiev School of Arts in Orel (Class of Honored Worker of Culture of the Russian Federation Nikolai Agdantsev). Graduate of the Academic Music College at the Tchaikovsky Moscow State Conservatory (Class of Arkady Starkov). He studied at the Moscow Conservatory in the same Teacher Class. 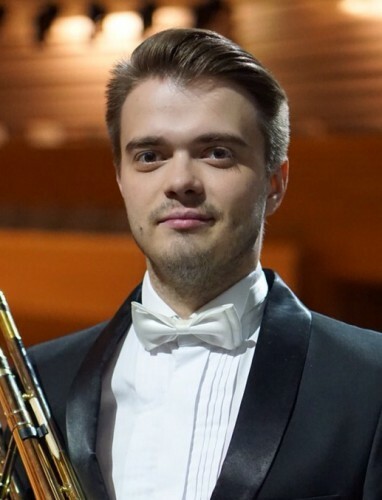 Since 2014, he is student of the St Petersburg State Rimsky-Korsakov Conservatory (Class of Honored Artist of Russia, Associate Professor Igor Yakovlev, since 2015 - Class of People's Artist of Russia, Professor Victor Sumerkin). Winner of the International Competition "Symphony" (Volgograd, 2012). Laureate of the II prize of Mravinsky International Competition (St. Petersburg, 2014). Participant of Jorgen Van Rein, Jay Friedman, Joseph Alessi and Igor Yakovlev master classes. Artist of the Youth Philharmonic Orchestra of the Mariinsky Theatre.